Coles Catalogue has wonders of the products of the week in this catalogue. You can see a lot of nice discounts on the savings and special products. Coles Catalogue has also Christmas treats and recipes. Make Christmas sweets with the recipes that you can read on the catalogue. New products of Coles from the category of Christmas are the meals and different sauces for your whole chicken. Bakery, deli, fruits, seafood and more to make your dining table amazing this month. Coles also has Christmas decoration, gifts and gift cards on this catalogue. Browse the products such as Rober Timms coffee bags that will cost half price. Kellogg's Nutri-Grain, All-Bran, Uncle Toby's muesli bars and more are included in this sale. Keep it simple with simple meals like Continental standard pasta and sauce. Masterfoods beef stroganoff is a down down deal. 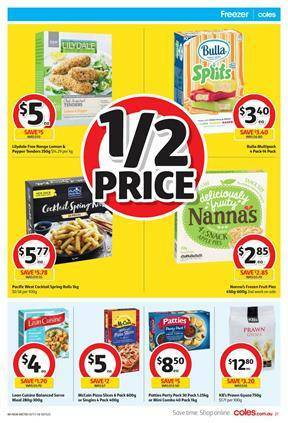 Don't miss out deli, seafood and meat deals on pg 20-21. Coles finest sausages 500g pack is only $7/pk. beef porterhouse steak is a classic product priced at $29 per kg at Coles. Tasty food is always possible to get at nice prices at Coles supermarket.